My first contact with a United States Ammunition Ship happened in the Fall of 1971 when I was assigned to the USS MAUNA KEA (AE-22) off of the Vietnam Coast. I remember one night at 10 P.M.. We had just barely turned our lights out and gone to our racks to sleep when the 1MC (loudspeaker) blared out "General Quarters! Fire, Fire, in Hold number 2! This is not a drill!". We hit the deck and went to our General Quarters stations expecting any moment to be blown into oblivion by the ammunition stored in hold number 2. But, fortunately, it was not to be - I am still here! The "fire" turned out to be an electrical short and sparking in an electrical box in the hold. Later in 1971 I was on deck one afternoon watching one of my buddies use the fork lift to move a pallet of 500 pound bombs (a pallet is 6 bombs) across the deck. The ship was rolling very badly and the pallet shifted off of the forks of the fork lift. It rolled over about 4 times, finally stopping as it smashed down onto the deck. About 40 sailors let go a collective sigh of relief when we realized that we were still in one piece. These shocking memories are still vivid in my recollection. That is why I have made this web site. I can put myself in the place of the sailors on the following ships. In 1944 the U.S. Navy had three horrible incidents with ammunition ship explosions. Each resulted in 100% crew+ fatalities. This web site chronicles these incidents. Also included here is the January1945 near-catastrophic attack on the USS MAZAMA (AE-9). That crew came within a hair's breath of immolation. Later that same month. the USS SERPENS (AK-97) met her end in a spectacular explosion that is also documented here. 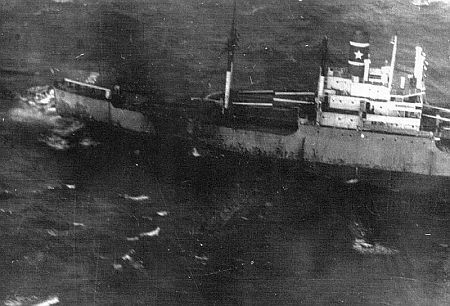 Lastly, the explosion of the USS SOLIS (DE-221) is summarized and the slow, deadly ordeal of the SS BADGER STATE is chronicled. This site is dedicated to those American sailors who have been lost in the performance of their duties. 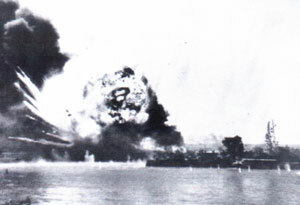 A view of the USS MOUNT HOOD explosion. On the morning of November 10, 1944 the USS MOUNT HOOD stood at duty in Seeadler Harbor on Manus Island, which is North East of New Guinea in the South Pacific. The ship was delivering and receiving ammunition for the 200 ships that lay in the harbor at that moment. Sailors were working in all 5 holds at the time. The ship was full of 13,910 tons of ammunition which included bombs, projectiles, fixed ammunition, rockets mortars and depth charges. Suddenly there appeared a small explosion near the middle of the ship that was quickly followed by an enormous explosion. The radius of the smoke was 1,000 feet and the smoke quickly rose to a heigth of 7,000 feet. The explosion caused damage to ships as far away as 2,000 yards and at least 30 of the nearby ships were damaged by the blast and flying ammunition. 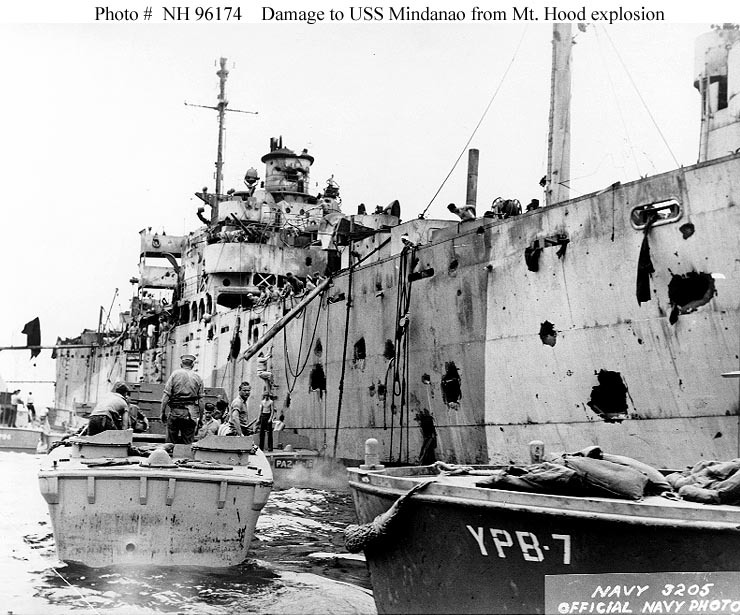 Major ships that were damaged were the USS ARGONNE, USS YMS-340, USS MINDANAO, USS ALHENA AND USS OBERRENDER. The USS MINDANAO. 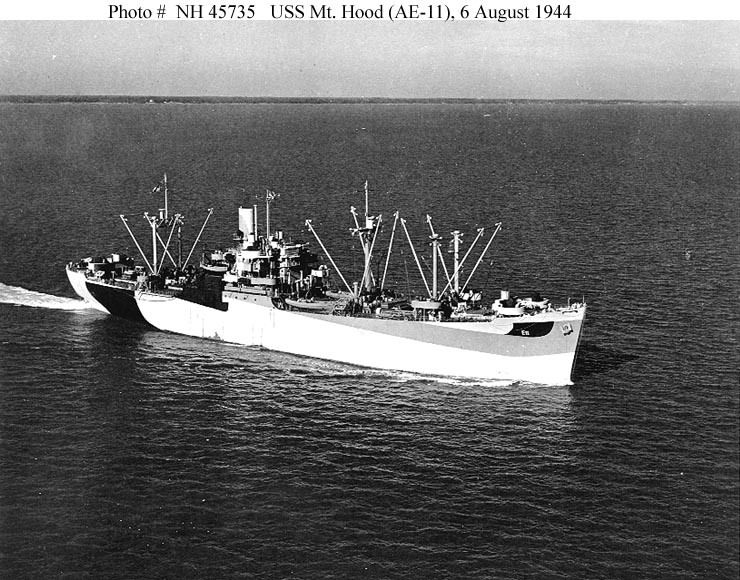 Just one of several ships that became victims of the USS MOUNT HOOD explosion. Nothing remained of the ship. 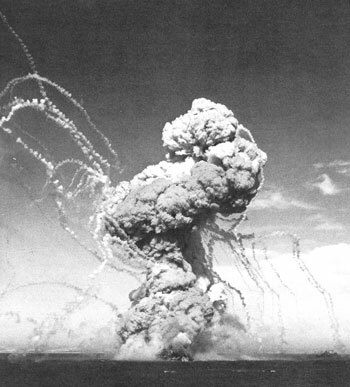 It was later determined that the blast tore a hole in the sea bottom 85 feet deep, 1,000 feet long and 200 feet wide. 382 sailors were killed and 371 injured on all effected ships. Needless to say no one survived aboard the USS MOUNT HOOD. A court of inquiry later determined that the blast was most likely caused by "rough handling" of the ammunition. At least one witness said he saw a Japanese two-man submarine surface and fire a torpedo into the MOUNT HOOD. However, the court of inquiry never found evidence of that and the Japanese state that none of their submarines were in the area at that time. A view of the USS M0UNT HOOD just a few months prior to the explosion. What was left of Port Chicago. Port Chicago was a shipping town on the San Francisco Bay. 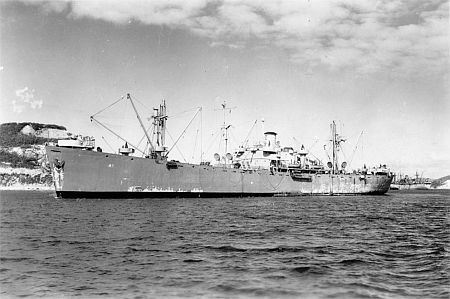 Liberty Ships and Navy Ships would come into the base and be loaded with munitions that would be sent out to the Pacific Theatre of operations. Late in the night of July 17, 1944 the SS E. A. BRYAN and the SS QUINAULT VICTORY lay at Port Chicago taking on enormous amounts of bombs, ordnance and cordite. Just about the time the 1,500 residents of the town were going to bed an enormous blast broke the silence of the night, blasting both ships and the wharf area around them to shreads. Passengers in an airplane flying over the area saw house-sized pieces of metal fly up past them. The blast was felt in Oakland, Alameda and San Francisco. Some areas thought that another earthquake had occured. Flames could be seen from 50 miles away and buildings had structural and glass damage for 20 miles distance. 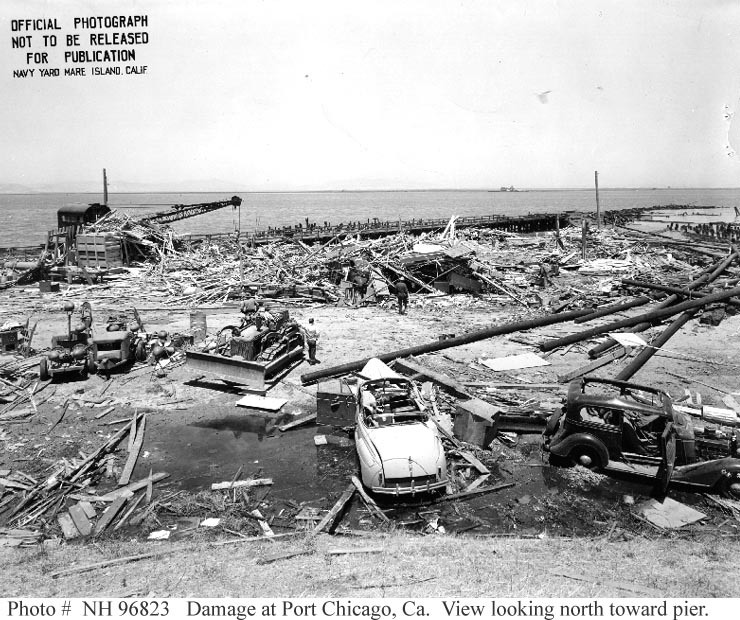 All of the homes in Port Chicago were damaged. A friend of mine was in a bar in Concord and he stated that glass shattered and people hit the floor as they thought the Japanese were bombing them. The next day almost nothing of the E.A. BRYAN was found and not much more of the QUINAULT VICTORY was located. QUINAULT VICTORY was found upside down and 500 feet from where it has been loading. 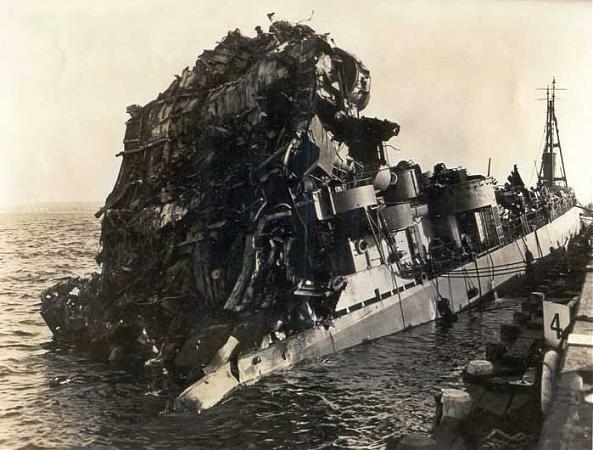 Also, very little was found of the 321 crew members who were loading ammunition on the ships that night. It was determined that the blast must have originated aboad the E. A. BRYAN. The reason for the blast was never determined but old ammunition was known to have been aboard the ships. When I was on the USS MAUNA KEA at Port Chicago (now known as Concord Naval Weapons Station) in 1972, you could still see the foundations of the houses of the town that had been destroyed and removed from the area. Two views of the West Loch explosions. In early 1972 I cruised through Pearl Harbor on the USS MAUNA KEA. I remember seeing some rather large, burned and rusted ships, half submerged in the harbor. Some had holes blown in their hulls. I always wondered what they were. Then recently information about this terrible incident came to my attention. 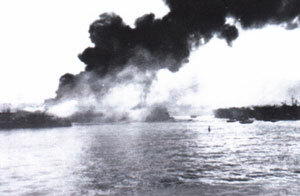 LST-353, while loading mortar ammunition in preparation for the Saipan operation, burst into flame and exploded with a series of great roars that were heard all over the island and far out to sea. Even though I have heard reports that there were a thousand killed, I believe the dead to total 163 and the injured at 396 - still a large number. A total of 6 LST's were destroyed along with 3 LCT's. What caused it? There is a theory that one 4.2 mortar shell exploded and the explosions followed down the line of LST/LCT's. 34 other ships were also damaged. There is also a theory that unauthorized smoking around gasoline fumes set it off. The blasts occured at 3 P.M. and the fires burned throughout the night. Combat artist Richard Gibney was there (had all of his clothes blown off) and he produced a very frightening painting of the incident. This incident has been called "The Second Battle of Pearl Harbor". Very little was known about it until the last few years. Probably due to wartime security measures. I understand that the hulks of these ships still lay there among the reeds of Pearl Harbor. I want to thank Ralph Hann for e-mailing me recently regarding this incident, one of which I had been totally unaware. Ralph was a sailor aboard the ship when this attack occurred. USS MAZAMA was in the Pacific at Ulithi when at 0650, a suspicious object was sighted off the starboard quarter. A few minutes later there was a large explosion that blasted the ship. She started a list to port and was down at the head. The crew began pumping and by counter-flooding and ballast she was eventually righted. By afternoon, transfer of ammunition was begun. USS MAZAMA was greatly assisted by the USS CURRENT (ARS-22) a repair ship that was instrumental in saving several ships in its career. Ralph states that 7 members of the crew were severely injured and his closest friend, Edward Marsh, was the only crewmember killed. What caused the explosion? Research has shown that the object that had been spotted was a Japanese Kaiten Suicide Submarine that had planned to get very close to the ship and launch a torpedo. Apparently the torpedo exploded prematurely, some short distance away from the ship. If it had exploded as planned I am sure that the USS MAZAMA would have ended up looking just like the USS MOUNT HOOD. I guess it could be said that she and the majority of her 280 officers and crew literally dodged a bullet. The USS MAZAMA went on to a very lengthy career. She was decommissioned right after World War II but was recommissioned twice more, for Korea and Vietnam. She was finally decommissioned in May 1970, 25 years after her close call. 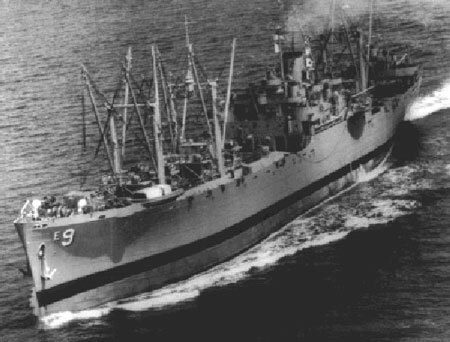 The USS SERPENS was a 10,000 ton Liberty cargo ship that had been commissioned in May 1943. On the night of January 29, 1945, she was located just off of Lunga Beach at the island of Guadalcanal. It was late evening and her crew was involved in loading vast quantities of ammunition and depth charges. Suddenly, the ship just exploded, killing 255 U. S. coast guardsmen and army personnel aboard. 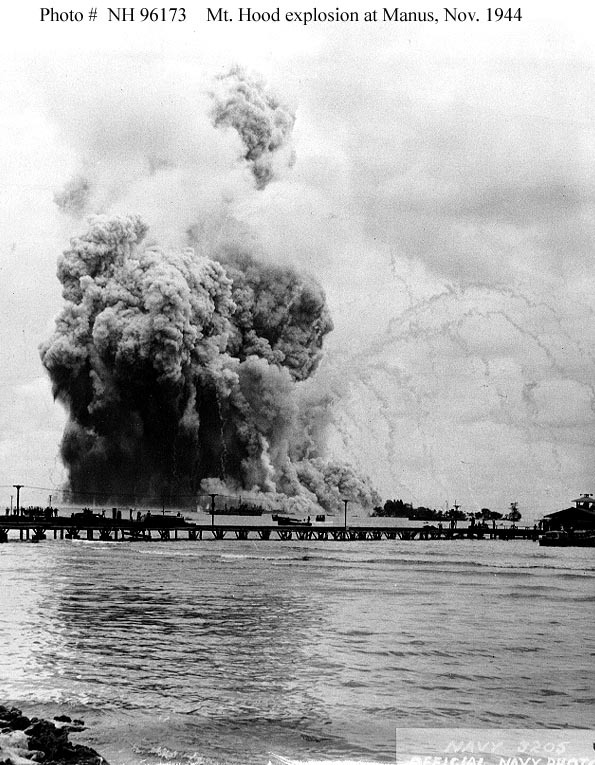 The explosion was so large that it killed one american soldier on the beach. Amazingly, two of its crew survived the explosion. An investigation showed that enemy action did not cause the explosion. This disaster was the largest loss of life in US Coast Guard history. 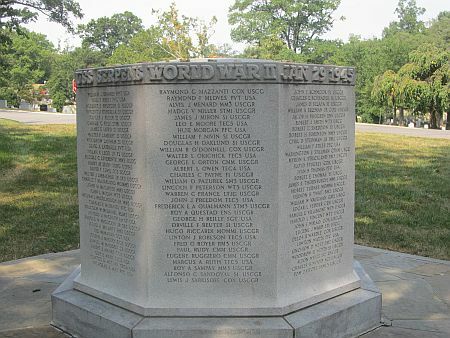 I took this photograph of the USS SERPENS memorial at Arlington National Cemetery in September 2013. The USS SOLAR spent most of World War II escorting convoys in the Atlantic and Mediterranean. On April 30, 1946 she began offloading ordnance at the Leonardo Piers so that she could enter New York Harbor. She had been assigned as a Sonar Test ship. Just after 11:30 AM she suffered an explosion in her forward #2 turret ammunition handling room. Two other explosions immediately followed. The fore section of the ship was destroyed and her deck was peeled up and back over her bridge. 7 crew were killed along with 125 injured. Due to continuing explosions she was abandoned. On June 9, 1946 her hulk was towed 100 miles from New York and sunk in 700 fathoms. The story of the SS BADGER STATE is one of a series of very bad luck. She was a merchant vessel that had been assigned to carry 500, 750 and 2,000 pound bombs from the State of Washington to Vietnam. Their Captain was Charles T. Wilson and there were 39 crew. To start off with, their ordnance cargo had been poorly stowed by the loading crew in Washington. Then they hit two very strong and unpredicted storms that began to tear the bombs from their pallets and wooden containers. 500 and 2,000 pound bombs rolled around the holds. The Captain tried everything from re-stabalizing the ordnance to trying to head southward to get out of the way of the enormous storms that caused his ship to roll from 30 to 40 degrees. One large rogue wave caused the ship to roll to 52 degrees. Every time they felt that they had re-stabalized the ordnance, more bombs would be torn free by the heavy rolling of the ship. The Captain and crew fought this battle from December 17th through December 26th with little rest or sleep, trying to contain the rolling bombs that were now striking each other and the metal sides of the ship. Few could sleep due to the radical rolling of the ship. Then, on December 26th, one of the 2,000 pound bombs exploded, blowing out a large hole in the side. No one was hurt by the explosion but the Captain knew he had to send out an SOS and abandon the ship. What other bombs may explode? As the rescue ship, KHIAN STAR, came into view 35 of the crew made it into a life boat and drifted toward the back of the ship. Incredibly, a 2,000 pound bomb fell out of the hole in the side and killed two of the crew and overturned the life boat. The survivors were later set upon by Albatrosses who tried to peck their eyes out. The Captain and four others who had stayed aboard the ship jumped into the water and made their way toward the rescue ship. All in all, 13 crew and the Captain were rescued. The SS BADGER STATE finally sank of her own accord on January 5, 1970. A Board of Inquiry found that the Captain and crew had made superhuman efforts to save their ship but a series of overwhelming occurrences had made that objective impossible. THE USS MAUNA KEA (AE-22) - Launched: 5-6-55. Decommissioned: 6-30-95. I was aboard her from October 1971 through July 1972. Fortunately, my old ship made it 40 years without blowing up! She was mothballed in the Suisun Bay Reserve Fleet in Carquinez Strait, not far from Port Chicago/Concord Naval Weapons Station on 12-18-98. Then on 7-12-06 she was towed out 50 miles northwest of Oahu and sunk as a target ship. After being blasted by rockets and bombs she refused to sink until late in the day. She was a tough old girl! This was, surprisingly, just a few months after my other ship, the USS ORISKANY was sunk as an artificial reef (5-17-06). PLUS over 15,569 times prior to this web site's reconstruction. THIS IS A "LARRY" WEB SITE. This web site was first established on November 30, 2000. This website was last updated on July 16, 2017.